The two test cases are (1) the views related to the Haiti earthquake that scholars expressed on their blogs and (2) the political controversies raised among biblical scholars by a blogger going under the name of N.T. Wrong. Nowhere in the chapter does Crossley explain how any of these political views impact on Jesus “scholarship” itself. If the point is to demonstrate how politically conservative biblical scholars are on the whole and how they fit the cultural and systemic paradigms that support the institutions and ideologies of neoliberalism then the point is certainly made clear enough. Again, what comes through loud and clear is that Crossley is embarrassed by the politics of his peers and he wants them to rethink and change their political views. Maybe the fault is mine; maybe I’m too familiar with the political and ideological concepts and have long taken for granted the place of biblical scholars within “the system”. I’m surely not Crossley’s intended audience. But there are two incidents that Crossley does refer to that I felt deserved far more elaboration and analysis than he gave them. And again, they are incidents that touch upon the ideological function of historical Jesus studies at a deeper level that seems to escape Crossley’s notice. This screams for Crossley’s analysis and commentary but Crossley only brought up these words of N.T. Wrong to demonstrate that Wrong was not an “atheist apologist”. What we see here is N.T. Wrong manipulating significant symbols (recall the propaganda models that Crossley bypasses as I mentioned in the previous post) to exclude Hector Avalos from “polite scholarly society”. Wrong’s own generalized and doctrinaire dismissal of Avalos’s critique of contemporary biblical studies with that manichaean symbol “fundie” speaks volumes about biblical scholarship’s ideological defensiveness. Surely a discipline that has at least a questionable scholarly relevance in a modern university is going to play the defensive and conservative game as a matter of self-preservation. (Is not this itself a question worthy of serious research?) Acting and speaking as a support or on behalf of neoliberalism’s (neo-)conservative or big-L “Liberal” values and playing to the constituencies that feed them is going to come as naturally as night follows day. Crossley misses all this. Would the alternative be to risk being accused of siding with someone cheaply and falsely cast out as a “fundie”? N.T. Wrong did express his/her own controversial political views but at the end of the day these were ignored or had no impact on the political outlooks of other bibliobloggers. This tendency for anything that might present a serious challenge to establishment thinking is deflected from causing any ‘harm’ by simply being ignored or sidelined — and that is illustrative of the way the Herman-Chomsky propaganda model works, as Crossley explains. No doubt Hector Avalos is well aware of that, too. The other case has to do with Chris Tilling’s blog series on Christian Zionism. James Crossley includes blogs by amateurs in his discussion of biblioblogs so I believe Vridar qualifies for his purview. Crossley’s point about the world of biblioblogging being subject to certain political ideological pressures would have been a touch stronger if he could have shown that a blog that clearly does stand apart from the scholarly establishment, yet whose content is reputed often to be the equal to the scholarly standards of several of the biblical scholar’s blogs, likewise posts controversial articles that directly challenge the neoliberal political ideologies and propaganda of the day without buckling under the pressure that is said to have caused Tilling to cave in. Crossley apparently fails to see his own place in the system he is perpetuating. His own voice stands to be ignored ultimately and as surely as “N.T. Wrong’s” on political questions. He himself is one of the bulwarks of an institution that serves little point other than to massage some of the major cultural symbols of the West and enable them to serve (presumably “politically correct”) causes. Any historical inquiry into origins of the systems or religions that has brought us those symbols must by definition conform to the models that sustain those symbols. This is the field of biblical studies and understanding its social functions enables us to understand why we find at its foundations so many unsubstantiated assumptions, circular arguments and lapses of logic. I don’t know of any other blog that so consistently attempts to bring these flawed foundations to wider notice and discussion. An increasing number of scholars in Old Testament studies haves, to their credit, been prising themselves away from these ideological functions that essentially serve a religion whose faith itself confuses earthly history with heavenly puppeteers. It is in the area of historical Jesus and Christian origins studies that the same radical change is yet to occur. 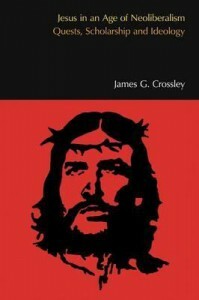 Crossley as Che Guevara Jesus? Posted on 2014-04-25 19:29:02 GMT+0000 by Neil Godfrey. 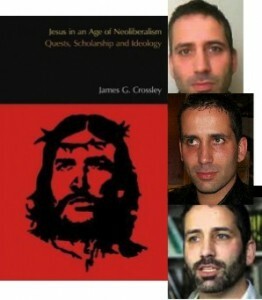 This entry was posted in Biblical Studies and tagged Crossley: Jesus Age Neoliberalism, End of Biblical Studies, Hector Avalos, James Crossley. Bookmark the permalink.